1. Cast on a bunch of stitches on a circular needle, join them and knit in the round. 2. Knit until the knitting is long enough to form the "lip" of the bag. 3. Making the holes for the drawstring is the hardest part. First, figure out how many holes are needed for the drawstring, and how far apart they must be to be evenly spaced. There must be an even number of holes. I chose 6, but I wish I had used more because there is too much space between them. For each hole, you will bind off a certain number of stitches on the first row, then cast on the same number of stitches in the same place in the next row. I bound off 4 stitches for each hole, but that was really too many because it made the holes huge. I probably should have bound off only 2 or 3 stitches. The hardest part of this for me was casting on the stitches in the next row. I had never cast on in the middle of a row before. A "backwards-loop" cast-on (also called single cast-on) is used and it took me a long time to figure out. I had to watch the video for this technique at KnittingHelp.com several times before I could do it. Note that the video just shows how to do the cast-on, not how to cast on in the middle of a row. 4. Continue knitting until the body of the bag is big enough. Then begin decreasing stitches evenly until the bottom of the bag can be pulled closed (note: I decreased every other row so the bottom of the bag wouldn't get too small too fast). Close the bottom of the bag and finish. 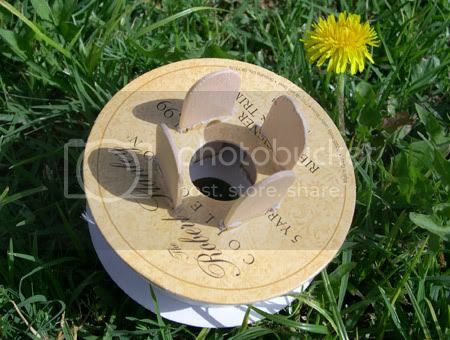 I took a spool of ribbon and stuck four popsicle sticks in it. It worked surprisingly well. 6. When the cord is finished, thread it through the holes in the bag. The two long ends should exit the bag next to each other - tack each end to the side of the bag, and voila - straps! 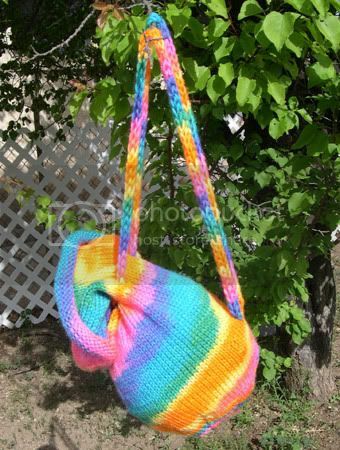 I know this isn't the most attractively colored bag - I used a scrap ball of yarn to do it. 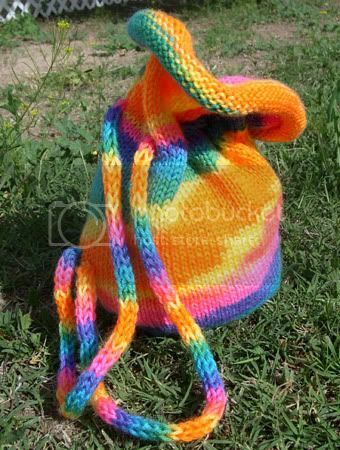 But I think some of my friends' children might find rainbow bags more attractive than I do, so I think I may give it to them to carry toys around in. On another note, it looks like Kevin and I will "take posession" of our new house on April 17th. We can't wait!